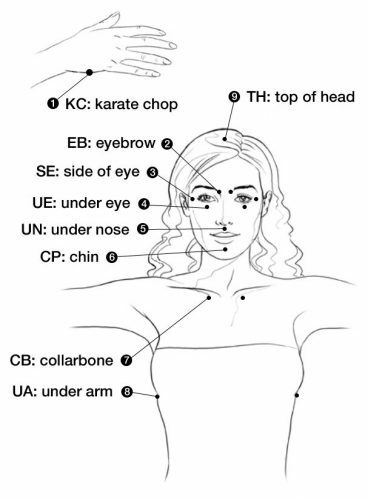 Emotional Freedom Techniques, or EFT (often known as Tapping) is brief novel intervention combining elements of exposure and cognitive therapy and somatic stimulation. EFT operates on the premise that no matter what part of your life needs improvement, there are unresolved emotional issues in the way. Even for physical issues, it is common knowledge that any kind of emotional stress can impede the natural healing potential of the human body. Efficacy has been established for obesity and food cravings, phobias, Post Traumatic Stress Disorder, anxiety, depression, and pain. Test the Initial Intensity of your feelings on a scale from 0 to 10, where 0 is no distress at all and 10 is maximum distress. This serves as a benchmark so we can compare our progress after each round of The EFT Basic Recipe. The Sequence: Tap about 7 times on each of the tapping points shown (either or both sides), while repeating a brief phrase that reminds you of the problem. The Reminder Phrase is quite simple as you need only identify the issue with some brief wording. Test the Intensity Again: Estimate your intensity level again on a scale from 0 to 10. If you are not down to 0 then repeat the process until you either achieve zero or plateau at some level. Call us on 07 3062 6822 to discuss your requirements and arrange an appointment. Alternatively, leave your details in the contact form and we will get back to you as soon as possible. Emotional Freedom Techniques (EFT) is still considered experimental in nature although it is gaining in scientific support it is not yet widely accepted as a formally validated scientific technique. Although the results of our research indicated that many people benefiting from the use of EFT with their food cravings, weight loss, anxiety and depression, the responses to the technique are individual. A lack of result or progress may mean you need professional assistance. If you have any concern regarding your health or mental state, it is recommend that you seek out advice or treatment from a qualified, licensed health care professional. Before making any dietary changes or discontinuing, reducing or increasing prescription medications it is recommended that you consult with a doctor, pharmacist or other qualified medical or health professional first.